Chris King External MTN Bottom Bracket with ceramic bearing and Stepped adapter to fit both Shimano and SRAM cranksets. SRAM cranks have a "stepped" axle where the lhs bearing sits on a 22mm shoulder, the rhs on the 24mm axle. The Chris King Stepped BB comes with spacers and shims to correctly fit a stepped SRAM axle - with axial load shared between both the lhs and rhs bearing (standard SRAM BBs use only the lhs bearing to locate the crank axially) - so this is an upgrade in many ways! Without the spacers the Chris King Stepped BB fits standard Shimano 24mm axle cranks. Specifically designed for Shimano-compatible external type crank/bottom bracket systems and SRAM GXP type - delivers every benefit you've come to expect from Chris King. We've been making our own stainless-steel sealed bearings here at King for 35 years and never has there been a component that benefited more from their quality and durability than the external bottom bracket. 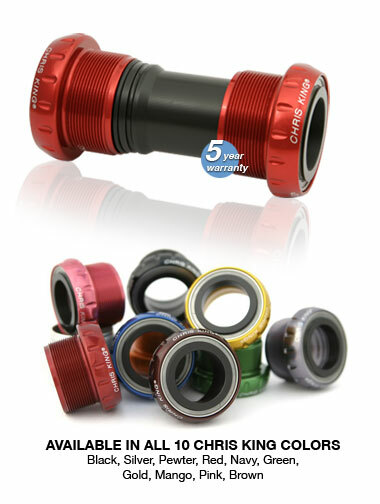 The Chris King bottom bracket is specifically designed for crank systems with outboard bearing cups and is available in the full assortment of colors that only King can do. It all starts with the bearings. We make our own bearings in-house and our process allows us to place more balls per bearing, 24 to be exact, than our competitors. More rolling elements per bearing translates to a stronger overall bearing system. A bottom-bracket specific upgrade to our legendary sealing system allows the bearings to be purged and re-greased using our precision made injector tool. This combination of strength and serviceability gives us the confidence to offer an industry-leading 5-year warranty on our bottom brackets. Compatible with most 24mm crank spindles, including; Shimano™ Hollowtech II, FSA™, RaceFace™, SRAM GXP™, Truvativ™ and Bontrager™ cranksets.